Terry Ballantine Bisson is an American science fiction and fantasy author best known for his short stories. 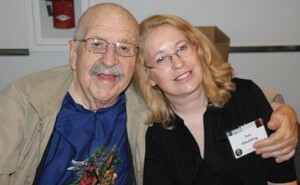 His stories have won two Nebulas, a Hugo, and two Locus Awards. Terry Bisson was born and raised in Kentucky. Learn more about this author at Terry Bisson’s website. 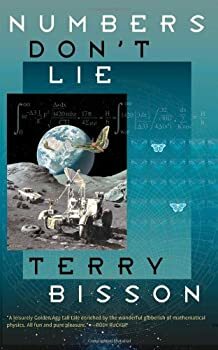 In 2005, Tachyon Press published three of Terry Bisson linked novellas in one volume, called Numbers Don’t Lie. This short, fun book follows Irving, a Brooklynite lawyer, and his genius best friend Wilson Wu on a series of adventures. Wilson is a six-foot-tall Chinese American polymath; he is a math genius, he’s studied meteorology, botany, Chinese herbs, pastry-making, law and the care of camels at a caravansari in the Gobi. The three stories collected in Numbers Don’t Lie were published separately in Asimov’s. Bisson realized that, combined, the stories have a certain momentum, and by combining them, he also did something insidious — he programmed the reader. By the time you start reading “Get Me to the Church on Time” a story about, well, time, it’s impossible not to laugh. What if America’s Civil War had been, not a war of unification, but a war to end slavery? What if John Brown had succeeded at Harper’s Ferry? In his short utopian novel Fire on the Mountain, Terry Bisson contemplates those questions. Bisson’s story is simple and human, but he uses it to muse on how the Civil War could have gone differently. Yasmin Abraham Martin Odinga is an archeologist recently back from a dig in Olduvai, returning home to Nova Africa. She is coming across the border into the United Socialist States of America to visit Harper’s Ferry, where she is delivering her great-grandfather’s memoir to the museum in that town. Yasmin’s great-grandfather was a twelve-year-old slave when John Brown and Harriet Tubman led their successful raid on Harper’s Ferry and started a war of insurrection against slavery. Short Fiction Monday: There is so much free or inexpensive short fiction available on the internet these days. In honor of the just-ended MidAmeriCon II and the awarding of the 2016 Hugos, this week's reviews are all past Hugo award winners that are available to read free online. This piece includes a great range of storytelling in few words. 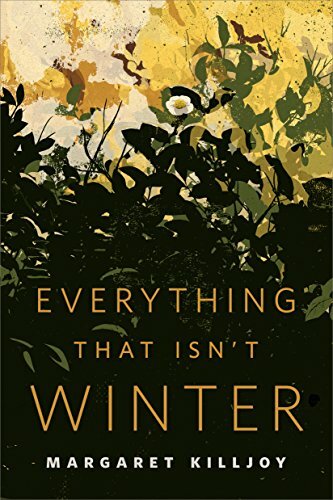 “Everything that Isn’t Winter” is set post-apocalypse in a small community that has carved out a comfortable place in the new world. The setting may sound run-of-the-mill, but what Killjoy does with it makes it come to life. I haven’t read or watched THE EXPANSE yet, but I purchased some of the related novellas when they were on sale at Audible. 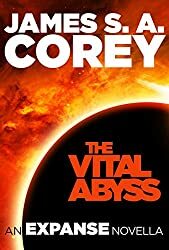 The first one I read was The Vital Abyss and I loved it. This is my type of science fiction. 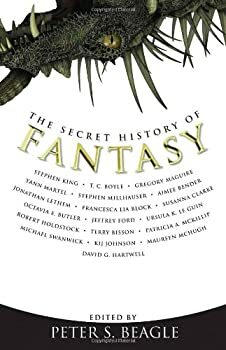 The basic premise of the SECRET HISTORY anthologies (there's also a science fiction one, The Secret History of Science Fiction, which I haven't read) is that there's a type of writing that got missed or buried because other things were more popular, more commercial, or dodged the spec-fic labeling. Certainly that's the thrust of Peter S. Beagle's introduction, and the two other non-fiction pieces by Ursula K. Le Guin and editor David G. Hartwell. Wyrldmaker — (1981) Publisher: Kemen of pasTreyn is the ruler of one of the tiny kingdoms of Treyn that are strung like beads on the path of the bottom of the wyrldwall. He has no queen, but is haunted by the memory of Noese, a magnificent woman who rose from the sea, taught him to love and disappeared again. Talking Man — (1986) Publisher’s Weekly: Having dreamt this world into being, the wizard called ”Talking Man” falls in love with what he has made and retires there. He lives in a house trailer on a Kentucky hillside close by his junkyard, and he only uses magic on the rare occasions he can’t fix a car the other way. He’d be there still if his jealous codreamer Dgene hadn’t decided to undo his creation and return this world to nothingness. When Talking Man lights out to stop her, his daughter Crystal and chance-acquaintance William Williams give chase into a West that changes around them. The geography shimmers and melts, catfish big as boats are pulled from the Mississippi, the moon crumbles into luminous rings and refugees from burning cities choke the highways. A novel of the new South with a liberal dose of the old, fantastic and gothic, a road novel leading to the city at the end of time, a postmodern, Sam Shepard, apocalpseone you can drive to in a ’62 Chrysler New Yorkerthis is a charming, literate, laconic tale, deceptively brief, teasingly allusive and very entertaining. Voyage to the Red Planet — (1990) Publisher: NASA may be bankrupt, but the dream of space travel never died. All you need is a wildcat movie producer, a brilliant midget cinematographer, a beautiful Russian Cosmonaut, a couple of Movie Stars, and a mothballed spaceship called the Mary Poppins. Then blast off, and you are about to make Hollywood history… On Mars! Pirates of the Universe — (1996) Publisher: In the shabby, war-torn, depleted Earth of the twenty-first century, Gunther Glenn wants to live in the utopian theme park “Pirates of the Universe.” He only needs one more mission as a Space ranger–hunting the enigmatic Peteys, 1200-kilometer voids in space whose “skins” can be harvested and processed into a substance more valuable than gold–to get his chance. But the arrival of a mysterious package and the disappearance of another Ranger ship into the Petey void sends Gun on a mission through the bureaucratic maze of the mother corporation, the virtual-reality maze of the Dogg, and the Escher-like multidimensional maze of the Tangle for the key to his future. The Pickup Artist — (2001) Publisher: From the award-winning author of Pirates of the Universe, a New York Times Notable Book of the Year, comes The Pickup Artist–a sharp, witty, and subversive exploration of the future of art, culture, and society. In the tradition of Ray Bradbury’s fireman who burns books in Fahrenheit 451, our hero, Hank Shapiro, is a pickup artist, a government agent who gathers for retirement creative works whose time has come and gone. You see, there’s simply not enough room in the world for all the art, so anything past a certain age must be cataloged, archived in the records, and destroyed, paving the way for new art. It’s a job that comes with risk and the pay’s lousy, but it covers the bills. And, after all, this year’s art is better than last year’s, isn’t it? But what happens is not nearly as important as the telling. Terry Bisson is an American writer in the satirical tradition of Twain and Vonnegut and perhaps Richard Brautigan. He can make you laugh and touch your heart in the same sentence. This is a book about love, death, and America. Dear Abbey — (2003) Publisher: Would you sacrifice humanity to save the planet Earth? Cole is an obscure professor at an undistinguished community college — a man without a future. Lee is a Chinese political refugee with a Texas accent — a man without a past. They share a tiny office, a taste for Edward Abbey (and Jack Daniels), and an awesome destiny. For the most fateful decision in human history is theirs to make. One fateful Friday night, Cole and Lee join hands (literally) and embark on a journey to retrieve a formula that will change, or end, human history. A journey through Time. Along the way, they are witness to all the horror and all the glory of our tomorrows — from the cannibal seals of the next Ice Age to the final campfire under a dying sun; from the seductions of 30th century Paris to the pleasures of a dinner party a hundred million years in the future. They even find time to meet man’s best friend, as well as his most indifferent enemy. It’s a billion-year leap — the perfect way to spend a long weekend that stretches all the way from Friday night to the End of Time. And your presence is requested as well. Introduction by Brian Aldiss. Cover art by Edward Miller.